On the tail of Old School Renaissance has come another movement—the rise of the fanzine. Although the fanzine—a nonprofessional and nonofficial publication produced by fans of a particular cultural phenomenon, got its start in Science Fiction fandom, in the gaming hobby it first started with Chess and Diplomacy fanzines before finding fertile ground in the roleplaying hobby in the 1970s. Here these amateurish publications allowed the hobby a public space for two things. First, they were somewhere that the hobby could voice opinions and ideas that lay outside those of a game’s publisher. Second, in the Golden Age of roleplaying when the Dungeon Masters were expected to create their own settings and adventures, they also provided a rough and ready source of support for the game of your choice. Many also served as vehicles for the fanzine editor’s house campaign and thus they showcased how another DM and group played said game. This would often change over time if a fanzine accepted submissions. Initially, fanzines were primarily dedicated to the big three RPGs of the 1970s—Dungeons & Dragons, RuneQuest, and Traveller—but fanzines have appeared dedicated to other RPGs since, some of which helped keep a game popular in the face of no official support. Black Pudding is a fanzine that is nominally written for use with Labyrinth Lord and so is compatible with other Retroclones. Yet what sets it apart is its consistently singular look, tone, and feel. Set firmly within the Swords & Sorcery genre, its look is cartoonish, its tone is slightly tongue in cheek, and its feel is gonzo. So, this is not the straight-laced fantasy of Dungeons & Dragons, but something a bit lighter, but still full of adventure and heroism. Drawn from the author’s ‘Doomslakers!’ house rules and published by Random Order Creations via Square Hex, Black Pudding No. 3 follows on from the well regarded first and second issues with the same mix of new character Classes, spells, magic items, monsters, NPCs, and adventures. Specifically, five new Classes, eight new monsters, eight NPCs ready to hire, and a wilderness on the road encounter as well as a pair of tables, and the usual character sheets designed to be used with the issue’s various Classes, one for spellcasters and one for non-spellcasters. The monsters start with the Ork Worgtrainer—both Ork and Worg, whilst the Hag’s Husband is the undead and unhappy companion of a Hag, a sort of undead golem whose unhappiness turns to hate… The Orgthool is a demonic beast which craves blood and can cast a single Fifth Level spell three times a day from its single eye—as can the eye’s owner should he take it, whilst the Szeznin, or Chaos Serpent, with its paralysing gaze and great length, is one of the great dangers to sailors at sea. Meanwhile, the Mangu can answer any question you like, but half the time will not be telling the truth. The chance that it might be telling the truth can be increased through the sacrifice of blood (or Hit Points). The issue’s other two monsters—the Gozog and the Crypt Golem—are not all that interesting. The issue’s scenario is ‘Into the Nest of the Dopplegangers’ by Matt Hildebrand. This is a low-level encounter on the road at a toll bridge over a fast-flowing river. Dopplegangers have replaced the guards at the toll bridge and plan to rob and kill the player characters. Yet there is something a little odd about the ‘guards’, something that the creatures have not quite got right. Spotting those oddities of behaviour is half the fun for the players and their characters, the other half being for the Game Master who has to roleplay them. This has the potential to be a nice and creepy one-session encounter on the road. One of the best features in Black Pudding is ‘Meatshields of the Bleeding Ox’, a collection of NPCs ready for hire by the player characters. As with previous issues, these showcase the new Classes in the current issue alongside the standard Classes—Fighters, Magic-users, Thieves, and more. Each comes complete with a hiring cost, likes and dislikes—which affect attempts to haggle with them, a line of background, and more as well as the traditional attribute scores and Hit Points. So Kerra Valteen is a Second Level Shield Maiden who likes mead and righteous quests, hates murder hobo crews, and carries the Shield of the Sky +1, whilst Ghak is a Second Level Fighter who likes gravy, hates loud sounds, and has never thought about much other than hitting things. The selection really should have showcased more of the new Classes as it would have been nice to see them in action, but again, this is both a good and useful mix of NPCs, hirelings, and even replacement player characters. Physically, Black Pudding No. 3 adheres to the same standards set by the previous issues. Now that means a lot of decent if cartoonish artwork to give it a singular, consistent look and lots of quite short articles, that are perhaps underwritten in places. The obvious issue with Black Pudding No. 3—as with the previous issues—it is that its tone may not be compatible with the style of Dungeons & Dragons that a Game Master is running. The tone of Black Pudding No. 3 is lighter, weirder, and in places just sillier than the baseline Dungeons & Dragons game, so the Game Master should take this into account when using the content of the fanzine. This though, should not be held against the fanzine or its authors. Perhaps some kind of setting material to put the new Classes, spells, magic items, NPCs, and monsters into context might help ground the fanzine and give the reader somewhere to play with its contents. Black Pudding No. 3 maintains the high standard as set by the previous issues. There is a good mix of Classes and NPCs, as well as a decent roadside encounter. For the Game Master running a weirder campaign, Black Pudding No. 3 provides further content with which to work. The Black Pudding fanzine will be available from Squarehex at UK Games Expo which will take place between June 1st and June 3rd, 2018 at Birmingham NEC. 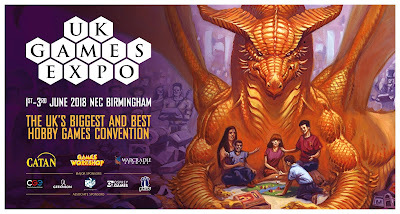 This is the world’s fourth largest gaming convention and the biggest in the United Kingdom.